Nononono, not Roger Pielke Jr, Bjorn Lomborg, Willard Anthony Watts, or Matt King Coal Ridley. It is worth asking how successful such attempts have been. Eli has learned a lot over the years about how humanity and the natural world are entangled, and how attempts to decouple them have not exactly worked out to plan. In the twentieth century those attempts were mostly the brainchildren of the "scientific" socialists, aka the communists. Marxism is industry oriented by birth, and to a marxist, such activities as farming, well, that can be improved on. 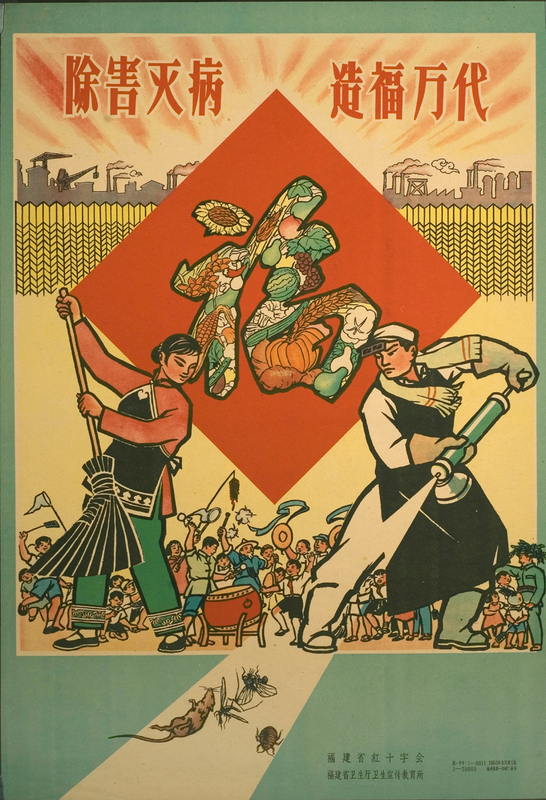 One of the best examples of early ecomodernism was China's Four Pests Campaign. Mao decided that there were four pests holding back China, mosquitoes, flies, rats, and sparrows. according to environmental activist Dai Qing, "Mao knew nothing about animals. He didn't want to discuss his plan or listen to experts. He just decided that the 'four pests' should be killed." Moreover, the idea fit in quite well with Mao's hard-line totalitarian Communist ideology. Marx himself was far from an environmentalist, proclaiming that nature should be fully exploited by humans for production purposes (a legacy which may explain China's poor environmental track record to this very day). It is amusing to note the marxist roots of today's ecomodernism, the next bright shiny thing being rolled out to block action on real environmental problems. Well, what happened? It turned out that of the four pests, the poor sparrow was the one that pissed the powers that be off the most because it ate a lot of grain. China was mobilized, the birds in hundreds of millions were killed. Details at the link. They became extinct in China. But the damage was done — and the situation got progressively worse. Locust populations swarmed the countryside with no sparrows in sight. Things got so bad that the Chinese government started importing sparrows from the Soviet Union. The overflow of insects, plus the added effects of widespread deforestation and misuse of poisons and pesticides, were a significant contributor to the Great Chinese Famine (1958-1961) in which an estimated 30 million people died of starvation. I spent some time on Marion Island. When I was there they'd just finished killing all the cats that they had earlier introduced to eat all the mice, but that had - instead - eaten the sea birds that nest in the ground (because there aren't any trees). Cats are no big deal. Try importing Cane toads, dandy animals for killing sugar cane pests. "Currently, most attempts to curtail the invasion of cane toads have been unsuccessful." "In Australian states where the cane toad is common, some 'sports' have developed, such as cane toad golf and cane toad cricket, where cane toads are used as balls." The Breakthroughvians who wrote the Manifesto claim they "write this document out of deep love and emotional connection to the natural world". They are having an annual shindig, the "Breakthrough Dialogue 2015", next week. The subtitle of the conference is "The Good Anthropocene". Perhaps the conference was scheduled before their dealer provided them with a souped up version of whatever it is they smoke. By the time they wrote the Manifesto they declare their aim is to "achieve a great Anthropocene". As all the sh*t our generation has already emitted causes the climate to change more rapidly than at any time since humans first evolved while the global population increases by several more increments as large as the entire population of China today, everything is not only going to get better, things are going to be great. Why do they believe this? Quoting from the Manifesto: "there is still remarkably little evidence that human population and economic expansion will outstrip the capacity to grow food or procure critical material resources in the foreseeable future". Because there is all this tonnage of remarkably little evidence, "humans are at no risk of lacking sufficient agricultural land for food". No matter what the population size becomes, no matter what all these people want to eat. The Manifesto declares that "it is very possible that the size of the human population will peak this century". Obviously then, there is nothing, repeat, nothing to worry about. If I was smoking seven packs of cigarettes a day but a careful analysis of my behavior suggested to people concerned about me that my consumption might stabilize at ten packs a day some number of decades from now, if I lived that long, isn't this great news, since my consumption looks like it might actually stop increasing? The Breakthroughvian trump card is there is "plentiful land and unlimited energy". Because of this, whatever the ultimate peak human population becomes, 10 or 15 billion, whatever, all these clowns and their descendants, for centuries to come, whatever they need or think they need, "can be easily found". They should adopt Tony the Tiger as their mascot. He knows how to say GREAT. He wouldn't put a subtitle on anything he was promoting, such the subtitle for the Breakthroughvian confab coming up next week, that merely said "good". Must admit I'm unfamiliar with the Four Pests campaign. Thanks. I'll bookmark the post and try to remember it next year when the . . . Prof. Tobis chides me for calling them "denialists," and I'm struggling to find a label that doesn't include "idiot" or "fool" or "terrorist" . . . "critics" of Earth Day claim that it celebrates the birthday of Lenin, since all environmentalists trace environmentalism to Lenin, Stalin and Mao. It's also a stunning example of Dunning Kruger Effect on the communist movement. A wonderful example of what not to do. I am trying to reconcile how " ...humanity must shrink its impacts on the environment... " and "...human societies must harmonize with nature..." are incompatible - but I'm afraid smoke and sparks are coming out of every cranial orifice, like a computer imploding by a James Kirk illogic loop. Does anyone understand just what the hell the Ecomodernists are trying to say? Hippie bashing by another name. It's the trademark of the BTI crowd. FWIW though it is hilarious that they have embraced marxist industrial policy to do it. The communist states were horribly on the environment. This is what annoys me so much about the claim that "capitalism" is ruining the environment. Unregulated capitalism can ruin the environment, but so can unregulated communism. Almost any economic system you can think of can be hard on the environment if it has high technology and stupid/evil people running it. I read some of the manifesto and got bored. Maybe they could've saved time by just saying "we hate organic farming and love nukes"? Not that there's no point at considering the physical space impacts of organics, but that's hardly an original thought. As for separating people from nature, that's bogus. It's good to maximize wildness in wild areas, but even in the densest city skyrise, having apartment flowerboxes that attract birds and bugs is better for people and better for nature. And they need their wild parks for kids to bike to. Here in Silicon Valley, much of the original land type was oak savanna - about one oak per 10 acres. Some areas were denser oak woodlands or other habitats entirely, but savanna was a large component. That savanna density is an achievable density today, even in an urban environment. I think it would be really cool to have it again. "... There is no polite way to say this. I find it philosophically, morally repugnant to contend that we have now "advanced" so much as a species we no longer have any need - for the congregation members we created, and who created us, as we are today. Discard our companion species now that we don't "need" them? Inexcusable. Indefensible. We worked together for millennia to get here. They need us, now, and I also contend that our need for them extends far beyond the practical. The biological drive for us to love our partner species is very deep. Just look at the attachments between urban humans and their enormously displaced pets. The dogs, cats, and koi are there because the humans need them. We all need our congregation members; deeply. Here on the farm we're re-learning how the sheep can contribute to our All. Humans have largely forgotten; the "lawns" we now expend incredible resources on – used to be sheep pasture, grazed down tight, illustrating the homeowners' wealth - in sheep. We gave their mowing chores to machines- which now own our weekends. The details of "how" we fit together are crucial; as we continue to learn. We're learning...."
Thanks for this educating amusement! The link to what Marx said is dead since 2013 (according to linked page). The first manifesto quote is self-contradicting enough to throw the BTI into the bin and proceed wasting time elsewhere, e.g. studying Marx. What 1970ies retards have cooked this up? When Europeans came to North America, they quickly set about killing off "pest" species like the gray wolf as they had in the Old World. They justified it as a means of protecting their livestock, making the environment here more convenient for human purposes. Of all the large animals they take, wolves predominantly preyed upon deer. Without the wolf, deer populations exploded and began causing havoc with local plant species as they consumed uninhibitedly, destroying the old patterns of forest growth. Many native species became threatened, along with the animals they support, while invasive and weedy species took over and don't provide the same level of ecological services as the extinct species. Less efficient ecological services lead to a less robust environment, and an intolerance to other pressures such as wildfires or disease. It is far easier to wipe out an ecosystem with reduced diversity and an overabundance of foragers. They are closer to the edge and require less pushing to go over. And less efficiency of natural ecological services means we'll have to spend more of our own money making up the difference at some point down the line. This manifesto seems like another example of firmly wedding one's self to short-sightedness for a brief period of economic gain for the few, with long-term losses for everybody. It is an almost conscious rejection of long-term thinking, and at this point we can't really chalk it up to ingorance. Applauding Kyle's last paragraph, methinks I also smell something psychopathological, possibly paradigmatically so. What is this? Amusing naivete? Orwellian doublethink? (Being the product of a think tank, the latter seems plausible.) Should I laugh or should I cry? Quoth Hank: "The biological drive for us to love our partner species is very deep." to me? ", and even more so with bugs and slugs. They'll never make the connection between degraded ecosystem services and loss of specific species, especially when there are self-interested parties promoting disinformation about causes and effects. Kyle Splawn: "Many native species became threatened, along with the animals they support, while invasive and weedy species took over and don't provide the same level of ecological services as the extinct species. " Hank and I are both wont to quote Leopold: “One of the penalties of an ecological education is that one lives alone in a world of wounds. Much of the damage inflicted on land is quite invisible to laymen." Few people can tell weeds from natives, unfortunately. Baba Dioum is another oft-quoted conservationist: "In the end we will conserve only what we love, we will love only what we understand, and we will understand only what we are taught." Is the next generation being taught to love nature? What's all too clear is that the great anthropocene extinction will claim many of our companion species before it abates. I'm just glad I won't leave offspring. In the time period in which Karl Marx wrote, the environment was far less of an issue, and Marx's work was not highly concerned with the environment or environmental problems. Despite this, there are some important contributions to the theory of the environment made by Marxism. The environment was primarily seen by Marx as a medium for human labor. He felt that nature was to be used by humans for their production purposes. Though humanity was a part of nature, nature's destiny was to be shaped by human labor. In the long run, history would witness the humanization of nature and the naturalization of humanity. The ultimate stage of Communism, from the environmental point of view, would mean that nature had been humanized to the greatest possible extent. Through science and technology, Marx thought humanity would progress to develop greater control over nature. In doing so, people would free themselves from dependency on the environment, mastering it instead of being enslaved by it. In present times, two schools of Marxist thought have emerged. The first is the "humanist" group, which draws its ideas from a younger Marx, and the second the "orthodox" branch, which takes its ideas from writings done by Marx when he was older. The humanist eco-Marxists attempt to cover the current environmental crises in their analysis. This group contests Marx's view of technology, and says that some level of production may have to be forgone for the sake of the environment. Merely overthrowing the capitalist class is insufficient according to this branch, the proletarian government must also limit its destruction of the environment. Orthodox Marxism blames capitalism for environmental problems. This group would promote science and technological development for the sake of mastering nature. While this may harm nature, one major objective would certainly be to learn enough about the environment to save it and all of its inhabitants. This could lead to some spectacular M&A opportunities in the bafflegab service industries. What a neat example of unintended consequences. Thanks for the lesson.